Yesterday the game would start fine and run good on low settings. Today however it wouldn't work at all. Everytime i start the game my mac freezes and a hardreset is the only option to change this. I started my mac in safemode to see what was going on. In safemade an error message occurs when i try to launch the game saying my graphics card is not supported. 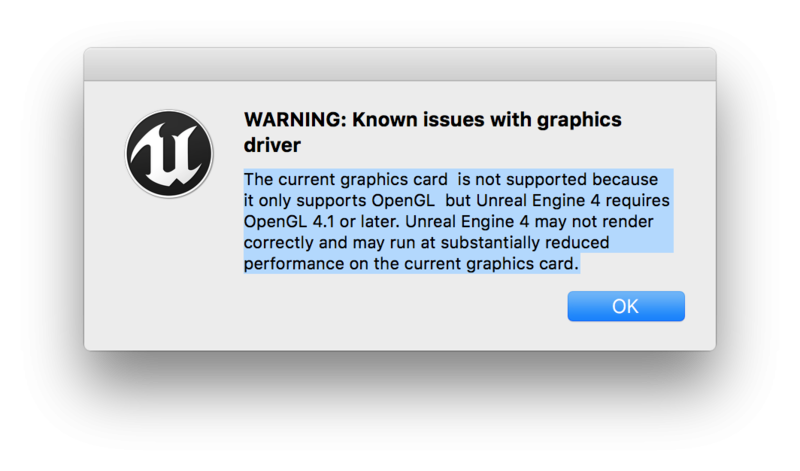 It says unreal engine need at least OpenGL 4.1 or later. My Macbooks Intel HD Graphics 4000 is able to run 4.1. Am I overlooking something? Why did it work yesterday... i did not change anything. thanks for the reply. 2 days later it just began working again until a couple of days ago. I re-installed the game 3 times. if i run it without any launch options in steam, my mac will just freeze. If i ad -openGL (<-don't know where i got that from) as launch option it will at least not chrash...it just quits in a split second after the loading screen... it even works sometimes. currently (November 2016) EVERSPACE is not officially supporting OpenGL, although we are working on that (basically to support Linux). You can force to use metal by adding -metal to the launch options. If you still get a freeze please work through this post.